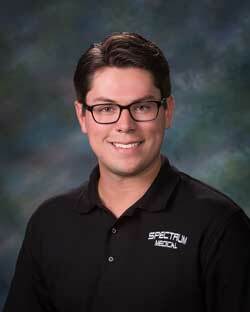 Drew Gunnell is a Physical Therapist Assistant at Spectrum Medical. He graduated in May of 2017 from Jefferson college of health sciences, and began his career at Spectrum soon after. Drew enjoys talking with patients during treatment and encouraging them to work hard towards their goals. Outside of Spectrum, Drew is an active member of his church serving in youth and outreach ministries, and playing guitar on the worship team. He also does missionary work with his church.